A native mint that is used as a bush food, an insect repellent and is also said to have medicinal properties. Mentha australis is commonly called River Mint. The leaves can be picked and either used fresh or they can be dried. 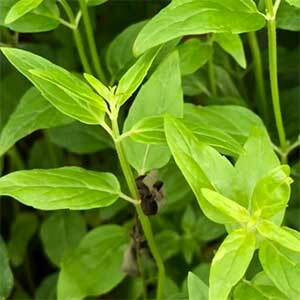 The fresh leaves are preferred as the flavour of this mint is more intense when fresh. As the common name suggests, Mentha australis is commonly found along creeks and rivers in damp areas. It is easy to propagate from cuttings and also possible from seed. Best in a humus rich moist soil it will also grow well in containers. Growing Mentha australis in a pot or container will also restrict the spread which may be desirable. Regular pruning will help keep the plant in a a more compact shape and encourage a bushy growth habit..
Common Names – River Mint, Wild Mint.